← Concept of flying tanks!! 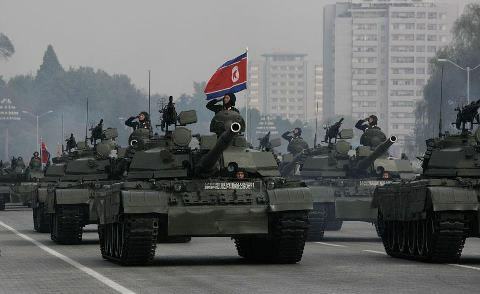 The P’okpong (storm) is the latest North Korean main battle tank. It is also popularly known as the M2002. Previously it was reported that the new North Korean main battle tank is a derivative of the Soviet T-72. However it seems that the M2002 is likely a further development of the T-62, which was license-produced in North Korea. The M2002 was developed in the late 1990s to replace the previous Ch’onma (Flying Horse) series of medium tanks, based on the Soviet T-62. It was first observed during performance trials in 2002, hence the designation. Actual production numbers of the new MBT are unknown, however it is believed that only few of these new tanks are operational. It is unlikely, that this new tank will be produced in large numbers, considering the current economical situation of North Korea. It is clear, that considerable modification were made to original design of the T-62. It uses a stretched hull with one road wheel added on each side. It is believed that some of it’s components and subsystems are imported from China, Russia and possible Belarus. Vehicle has a welded hull and turret. Turret has a large wedge-shaped armor module, bolted onto the front for improved protection. A large turret bustle is built at the rear, which possibly contains crew gear or additional ammunition. This MBT possibly might be fitted with explosive reactive armor kit. However this tank looses in term of protection to most current MBTs. The M2002 is possibly armed with a 115-mm smoothbore gun, similar to that of the T-62. It is capable of firing a wide range of ammunition, including HE, HEAT, HE-FRAG and APFSDS rounds. Despite that it is inferior to modern 120-mm and 125-mm tank guns. This tank might carry over 40 rounds of ammunition. It is believed that this gun is loaded manually. The P’okpong uses a relatively modern computerized fire control system. Secondary armament consists of coaxial 7.62-mm machine gun and another manually-operated 14.5-mm heavy machine gun, mounted on top of the roof. It might be used to engage ground and low-flying air targets. It is believed that this tank has a crew of 4, including commander, gunner, loader and driver. This tank is powered by a turbocharged diesel engine, developing ~ 750 hp. The road wheels and drive sprockets appears to be T-62 components. Vehicle can be fitted with additional fuel tanks for expended range. The M2002 losses to most contemporary main battle tanks in all critical aspects, such as protection, firepower and mobility. It could not match even older Russian, Chinese or South Korean main battle tanks. Currently it is unknown if any specialized variant of this MBT, such as armored recovery vehicle, bridgelayer or engineering vehicle have been produced. Posted on April 12, 2013, in Army. Bookmark the permalink. Leave a comment.